The Boston Red Sox are scheduled to open the 2010 season by hosting the New York Yankees on Monday, April 5 at Fenway Park. The club will also play two exhibition games against the Washington Nationals at the conclusion of the 2010 Spring Training season, Friday, April 2 at City of Palms Park in Fort Myers, FL and Saturday, April 3 at Nationals Park in Washington, DC. Major League Baseball and the Red Sox today released the complete 2010 regular season schedule. The Red Sox are scheduled to play a total of 72 games with their American League East Division rivals, 18 each with Baltimore, New York, Tampa Bay and Toronto. After a scheduled opening at Fenway Park from April 5-8, the Sox and Yankees are scheduled to play a pair of weekend series in Boston, May 7-9 and October 1-3, the final three games of the regular season. Boston will visit Yankee Stadium for games on Monday and Tuesday, May 17-18 to be followed by two weekend series in the Bronx, August 6-9 and September 24-26. After the Red Sox and Yankees complete the season’s first series on Thursday, April 8, Boston travels to Kansas City for three games before playing the Twins in the first ever series at Target Field in Minnesota, April 12-15. The Sox return to Fenway Park to face Tampa Bay, Texas and Baltimore in the first of two season-high 10-game homestands, April 16-25. Boston takes on the Angels, Yankees and Blue Jays in the other 10-gamer, May 3-12. Boston will have 18 games versus National League opponents, hosting Philadelphia, Arizona and Los Angeles for three games apiece while playing three-game series at Philadelphia, Colorado and San Francisco. 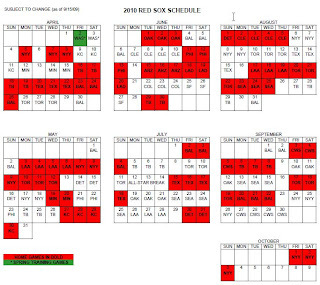 The Red Sox complete 2010 schedule is attached. Game times for the 2010 season will be finalized and announced at a later date. All dates included in the attached schedule are subject to change.